One week ago this stream was over the top of this bridge. It’s still well out of it’s banks. Though well downstream of the canyon mouth, this streamside park was completely submerged a week ago. Note the vegetation accumulated in the fence to the right. The park is still closed by public safety officials, as are most areas adjacent to the affected streams. The road was only recently re-opened. I live in a desert. That may sound like a strange home for a fly tier and fisher, but technically Colorado’s eastern plains are categorized as a high desert. While our mountains (hopefully) receive copious amounts of snow in the winter, here east of the Rockies we are in a “storm shadow” of sorts. Moisture coming from the west is forced up over the Rockies (and the Rocky Mountains in Colorado are higher than in any other region of the range) where the air cools are the moisture falls out in the form of rain, sleet, hail or snow. By the time the air mass reaches what we refer to as the front range, the eastern side of the mountains, most of the moisture has precipitated out and the air falls and warms so it can hold more humidity. That results in relatively little moisture for us. It’s the same effect eastern Oregon sees when weather patterns come off the ocean and over the Cascade Mountains. 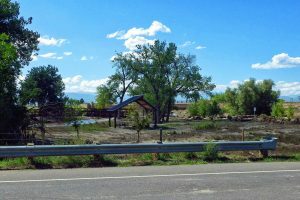 Colorado’s eastern plains agricultural industry is dependent on reservoirs to store run-off from snow melt and release it for irrigation when needed. You may or may not find this interesting, but by now you are almost certainly wondering “What the heck has this got to do with fly tying?” a very fair question, please have patience. Within the past week Colorado’s Northern Front Range experienced some rather unusual weather. A lot of you may know this already. We got rain, lots and lots of rain. Unheard of amounts of rain. Some areas on the front range received more than an average year’s moisture in the span of just a few days. I heard this referred to as a 1000 year storm, meaning a storm of this magnitude could be expected on average once every 1000 years. The National Weather Service actually referred to the storm as a “storm of biblical proportions.” Perhaps a bit of an exaggeration, but still… Seems pretty unlikely you’d ever need to worry about a 1000 year storm, unless of course you’re there that one year; so right now flooding and property damage are on most people’s minds here in north-eastern Colorado. Whether they are fly tiers or not. In my mind (and this is not at all scientific) two types of flood damage occurring. Neither is any more or less devastating to those affected, it’s simply a difference in circumstances. First was the flash flooding. This happened very quickly and in the mountain drainages and areas near canyon mouths. This happens very fast. There are large areas of land than drain steeply into narrow ravines and canyons so when rain occurs tremendous volumes of water are funneled into the narrow river corridors. In our case, this was exacerbated by the preceding dry conditions that baked the earth creating a crusted surface. The crust discourages water from soaking into the ground and it runs over the surface like a spill on a countertop, a steeply pitched countertop. The dry conditions also mean sparse vegetation so there is little growth and root structure to slow water velocities and hold back soils. Water rushes into the drainages carrying vast amounts of sediment and dead vegetative material such as leaves, branches, dead grasses, etc. All the small ravines soon join in the larger ravines and then the river channels; soon the rushing water gains tremendous volume and speed. This is when we begin to see the water carrying larger logs, trees, rocks and eventually vehicles, propane tanks, even buildings downstream. We saw a lot of this, an awful lot of this. Tragically, this happens very quickly and it caught many people off guard without shelter, food, electricity, water, sewer services or means of escape. It seemed even the meteorologists were caught somewhat by surprise as no significant warnings seemed to be transmitted until the silt hit the fan so to speak. The volume of rain, and the time the storms procrastinated over affected areas were almost unbelievable. Nearly all the roads in the affected drainages had significant portions that were washed away. Not just the asphalt damaged, but several feet of soil and rock from under the roadway completely washed away. In many cases I believe new road beds will likely need to be blasted out of canyon walls because there is simply no earth left to build a replacement road on. I won’t go into more detail, stories and pictures are blanketing the news, internet and social media sites, but this is a dramatic and serious mess; and unfortunately in some cases deadly. The other flooding that is occurring is further downstream. It looks much more like the flooding seen most years across the Midwest and Mississippi River. The gradient of the land has lessened here so the velocity of the water begins to slow. The water is not as channelized; it’s flatter so the water can spread and it covers incredible amounts of acreage. Debris such as silt, trees and all sorts of pollutants that are introduced into the flood waters when sewage treatment facilities, gas stations, oil wells and storage facilities for all sorts of chemical or other substances are damaged. These are then carried with the flood water and as it spreads and slows they are deposited in subdivisions, farm fields and anyplace else the water covers. There is more warning before this portion of the event, more notice for people to evacuate, but it’s no less damaging, dangerous or tragic. What does all this mean to us as fishermen? Well, the best news is we are talking about a relatively small area compared to the total of Colorado’s fishable waterways; really just a handful of drainages in the northeastern portion of the state. For those fishing this area specifically we should keep these things in mind. A high volume of water is not necessarily fatal to the fish. At the lower end of the flooding there is more risk of pollution and silt build up being issues. But there are fewer fish in these stretches of the rivers and they are better adapted to environments with warmer water and sediment (these are primarily carp, suckers, bass, panfish and a few other warm water species) because those are natural conditions on the plains. Of course not to this extent, but still, fish are survivors. 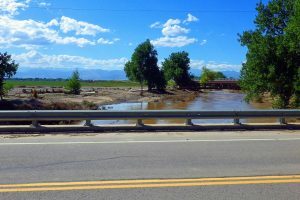 A more serious loss on the plains may result from fish straying from ponds and river channels and ending up in areas that are normally fields or pastures; when the water recedes many of these fish risk becoming stranded. There are undoubtedly fish that have washed downstream (trout) that will perish eventually due to unsuitable habitat and high water temperatures next summer. On the other hand, when the waters recede we may find interesting opportunities, at least temporarily, to fish for species we have not typically seen in areas we have fished in the past. Perhaps an influx of pike, walleye, grass carp or maybe even trout. Additionally, many of these fisheries are heavily supported by stocking operations and those that are will probably recover (at least the fish populations) relatively quickly. Upstream we may see different scenarios. There may be some unintentional fish introductions from breached dams or simply overflow. Some fish probably washed downstream, but I suspect most clung to the river banks and mid-stream obstructions much as they do during run-off and are likely still near where they started. As the water comes down they will find new holes, riffles, runs, woody overhead cover and possibly even boulder fields in which to live. What I wonder as we approach what we in cold weather regions refer to as “fly tying season” is what flies will we be tying for next year’s fishing conditions? Finally, the fly tying! Well, there is no doubt the river bottom has been scoured and cleansed. Usually, this is a good thing. It rids the stream bed of sand and silt that clog gravel needed for insect survival and fish spawning. But did we get too much. Did this year’s crop of immature bugs wash away? Or will we see a shift in bug populations? Perhaps stoneflies, which are known to live deep in the streambed and need clean well oxygenated water to survive, will be more prevalent. Being deeper in the steambed strata may have protected them from the scouring currents and the fresh clean gravel and rocks may be better habitat for them. How about the midges, which prefer sand and silt, will they become scarcer? Scuds and sowbugs thrive in slower weedy streams, how will they fare? Will there even be significant weeds? If not, that could have a major effect on caddis, mayflies, stoneflies and other aquatic bugs that are herbaceous. This could carry all the way up the food chain. On the other hand, didymo (rock snot) had infiltrated portions of our streams; did the heavy flows eradicate that problem? Will there be enough bank-side vegetation to support terrestrial populations. Well, we probably won’t know the answers until we begin fishing next year. But here’s my advice to those fishing this area next season. Attend the shows and the fly shop demos this winter. But look for more than the latest midge or baetis patterns. If you don’t fish many stoneflies, bone up on some of these patterns. Try to build a more varied box. We may find pockets of localized bugs. This might mean we need to fish stoneflies for ¼ mile then switch to midges, PMD’s or caddis. Some sections may have little bug life, but they could be ideal for pitching a streamer. I believe we’ll have good fishing sooner than many people expect, but be ready to adapt to take advantage of it. Part of that is building a more versatile fly box this winter. See you at the demos!